Small business and startup owners are invited to a free event on Friday 9 June to learn how they can boost innovation to grow their companies with the help of the University of NSW’s TechConnect and the NSW Government. The event will be held from 5pm-7pm at UNSW’s Kensington campus and interested business owners can register online to attend. The NSW Government, through its Boosting Business Innovation Program, is providing $12 million to the state's 11 universities - including UNSW - and the CSIRO to help them work with local businesses to boost innovation. Friday’s event is supported by the Boosting Business Innovation Program and TechConnect, a UNSW incubator program that helps small to medium-sized businesses and startup entrepreneurs access the university’s world-class research and facilities. TechConnect also provides a co-working space and offers matched funding of up to $15,000 to help companies bring innovative ideas to market. 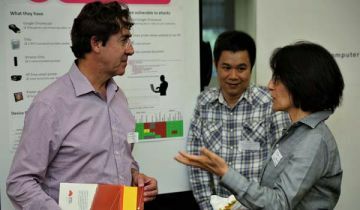 The 9 June event is a great opportunity for company owners to meet UNSW researchers and find out how they can access the university’s world class research and facilities to boost their business. Parking is available from Gate 14 at UNSW's Barker Street entrance and food will also be provided.